Cooler: HIS IceQ further cool down the core temperature dramatically with 11C lower than original. 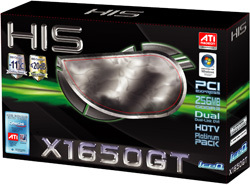 HIS X1650GT delivers superior mainstream performance with industry-leading image quality and best-in-class HD video. With ATI's new, easy to use “plug-and-play”CrossFire™ configuration and unmatched image quality features, the HIS X1650XT delivers better gaming and home theater viewing experiences than the majority of today's best consumer electronic brands. Get double barrel multi-GPU gaming performance that works with all games by just adding another HIS X1650GT graphic card for powerful GPU sharing. Starting with a HIS CrossFire Ready graphic card and motherboard, plugging another HIS X1650GT graphics card. HIS CrossFire™accelerates all your games, all the time, and delivers the highest image quality modes and resolutions with no special software or patches needed for compatibility. HIS Turbo edition guarantees a dramatic range of overclockable speed on your card. IceQ series come with both Turbo and non Turbo (standard) editions. Check for the box containing this label. 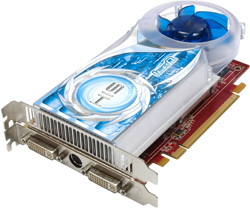 It identifies this is a "Turbo" edition card and marked with the guaranteed overclocking speed in core and memory. I've got this version of this card,I satisfied with the performance.